Much discussion online whether this is a Snowy Egret or Great Egret. Black legs and yellow bill is a give away. (Although some saw yellow feet which might change the ID). 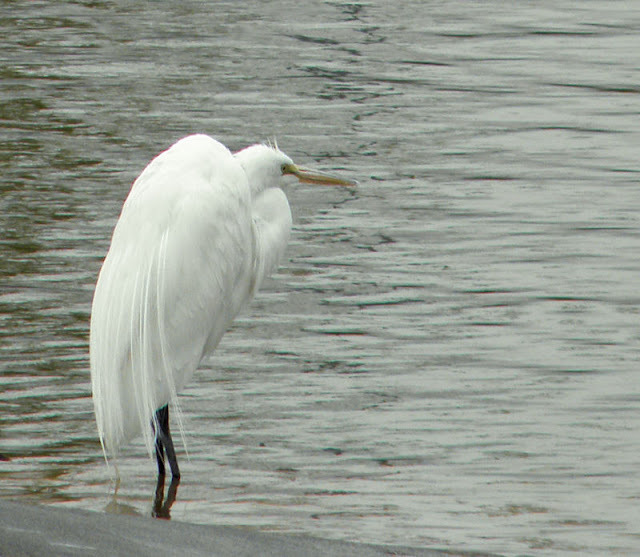 This Great Egret showed up in Ashley Pond after all the wind and snow the past few days. Sighting caused much bird watching stir. Good thing the gators are gone. What a pretty bird, whatever it is called. Your weather doesn't sound much better than ours right now. Our weather IS your weather. These days the jet stream is bringing your weather to us before it moves from hear east. Lately our strong winds are ending up as tornado touchdowns in the Southeast.